Be sure to clear of the client's website localization requirements, including webpages to be localized, images and Flash to be processed, deadline etc. Extract the text to be localized, use CAT tools to analyze the volume in translation, typesetting and engineering etc. Submit the quote to the client and get approval. Make these matadata of website accordingly localized with the needs of target users. Images , Flash and Video to be localized of the website. Re-organize the structure of website and webpages with localized elements, to adapt into multilingual layout. 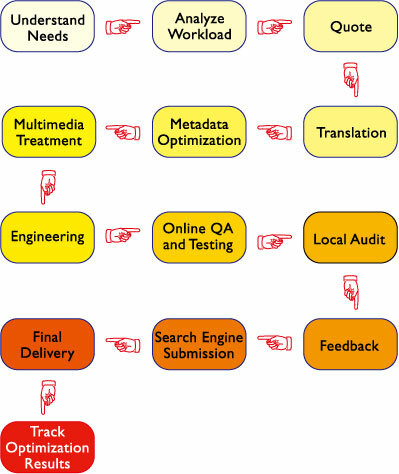 Implement linguistic & layout checking and function testing page by page, and make revisions until satisfactory. Put the localized website into use at the local, in order to test the website. Revise the website content and layout according to client's corrections, until they are satisfied with. Submit the client’s satisfying website to all search engines, in order to make the website indexed by search engines. Upload the entire multi-language website to client's host directly. Or send them website in a package. So client can upload the website by themselves. After optimizing website and submitting the website to search engine, special projector will track optimization results of website, to discover and solve problems in time.